Prepare the dessert crepes batter as per Julia Child’s recipe below. Whip 3/4 cup heavy cream with 1 tbsp granulated white sugar and keep in the refrigerator until ready for use. If you have leftover whipped cream, you can freeze it (see here for instructions)! Cut up or slice fresh fruit of your choice and set aside. (Or prepare a different filling of your choice, ie. nutella and banana slices) Prepare additional toppings of your choice, ie. nuts, brownie bits, chocolate chips, etc. Heat a large non stick pan over medium high heat. Ladle enough batter into the pan to coat the bottom of it. Swirl the pan immediately to spread the batter evenly. Then cook until you start to get air pockets underneath the crepe and it lifts off easily from the pan. Do not overcook or your crepe will brown. Flip the crepe over in one quick motion (this may take a few tries before you get the hang of it) and cook the other side until just cooked through. Do not brown the crepe. 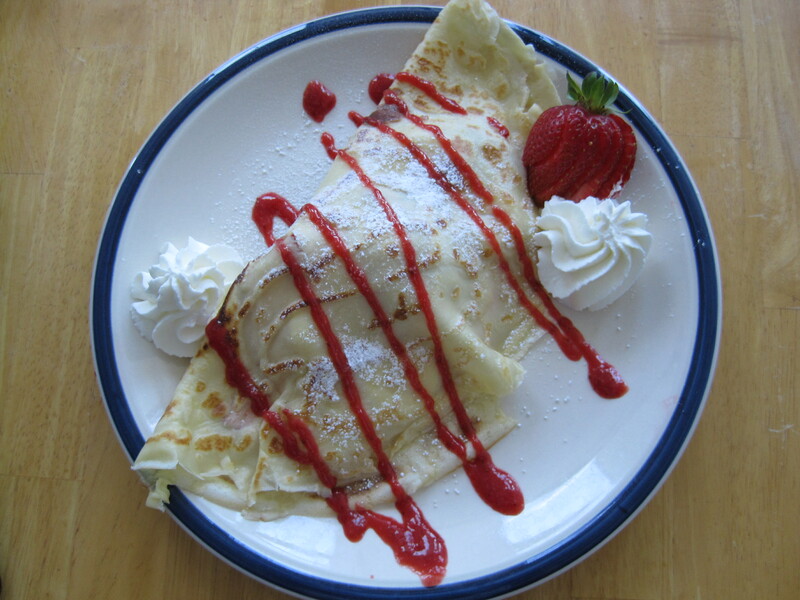 Slide the crepe onto a large plate. 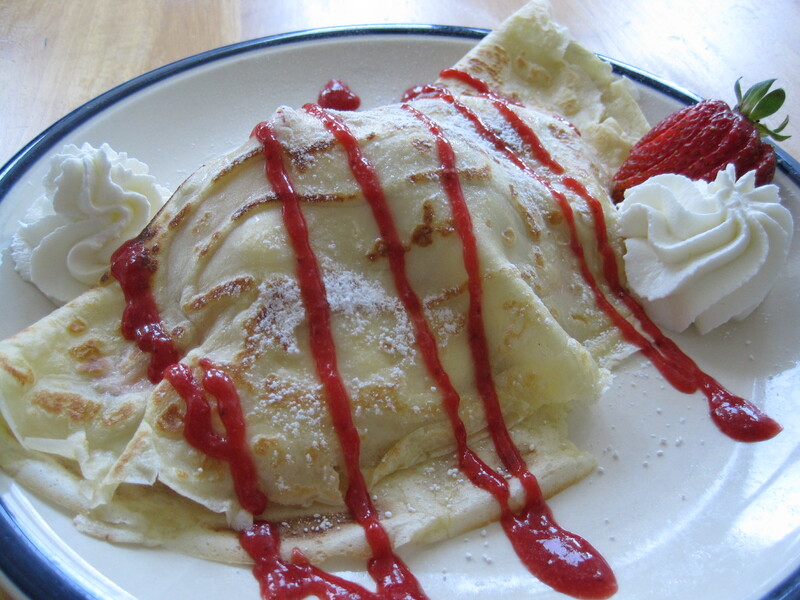 On one half of the crepe, add the fillings of your choice (ie. 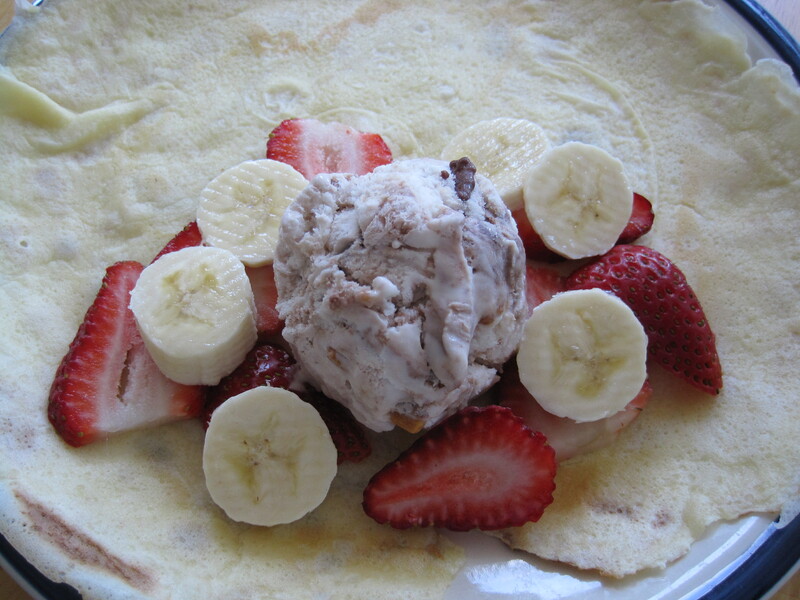 a large scoop of ice cream and fresh fruit or nutella and banana slices). Fold the top half of the crepe over the fillings. Top with whipped cream, sauce(s) of your choice, additional fruit and/or other toppings, and a dusting of powdered sugar. Serve immediately. In a large pot, over medium high heat, bring the strawberries and water to a boil. Add the sugar and lemon juice and stir until the sugar has dissolved. Stir constantly until the sauce thickens. Then remove from heat and use a blender or a hand-held blender to puree the sauce until smooth. Adjust sugar and lemon juice to taste and reheat if necessary. Allow the sauce to cool before use. Store in the refrigerator. 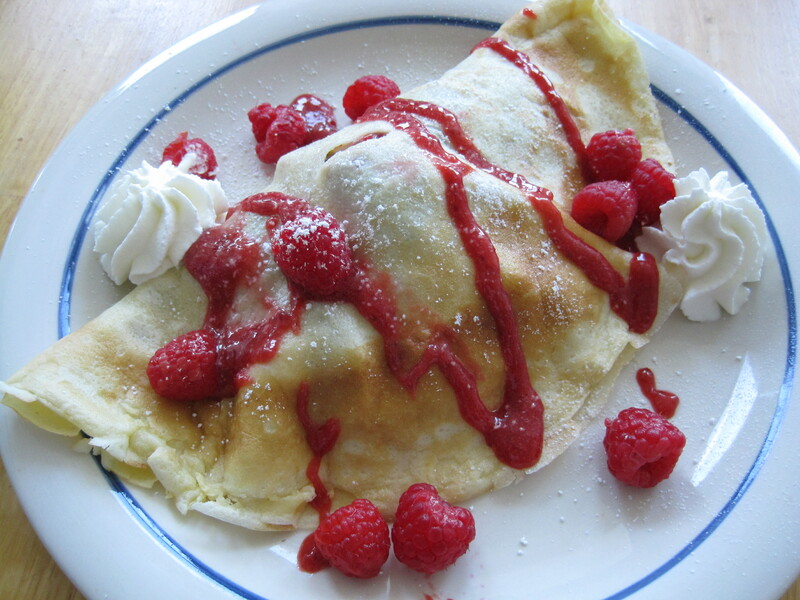 Hi, I love doing crepes too, and best part is they can be made ahead without the filling, of course. Not only that, they freeze really well..just put parchment/wax paper in between to prevent sticking. I love just the basic and oh-so-french way of lemon juice and sugar. Have u ever tried the Crepe Cafe on Queen St., just across from CityTV?? Inexpensive and many choices. They also serve savoury crepes and european-style sandwiches. Bonus as well for serving Illy coffee! Thanks for the Great tip on freezing crepes! I’ve never had crepes with just lemon juice and sugar before. I’m definitely going to try it next time! I have been to Crepe Cafe on Queen St 🙂 I like their menu and I’ve tried 2 or 3 of their dessert crepes. Alison why am I not surprised that you have a ranked list of your favourite desserts? : ) I’m curious to know what the other contenders are!